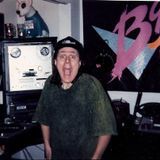 Chicago radio stations, B96 and WBMX, in the late 80’s and early 90’s, heavily influenced Jeff’s musical tastes. Jeff’s favorite DJ was Tim Schommer and he loves and collects Freestyle to this day. After high school, Jeff enrolled at Gateway technical collage in Kenosha Wisconsin for radio broadcasting and focused on multi track mixing and editing. More of the behind the scenes type guy, then behind the microphone, Jeff landed a job at the iconic D.J. International Records in the early 90’s as an assistant engineer, and quickly became the head engineer and studio manager. Jeff was responsible for moving the studio to a Protools 3 recording system from their 24track 2 inch Otari.